So, about two and half weeks ago, Doug traveled down to the annual season ending Wurstfest Centerboard Regatta. Lake Canyon Yacht Club has this launching ramp that is rather hard to forget. It has a reputation. It’s infamous. Just ask a J/24 sailor from District 14 or click on the picture below and go to the Texas J/24 website and see how to launch a J/24 by pushing it down a ramp. Just the thought of it makes me think about fingernails on a chalkboard. It’s been an off sailing year for me, so Doug headed down to Lake Canyon, alone, with my car … my favorite car ever, our tandem trailer, my dolly and his good Aussie Laser. Headed down to LCYC to launch on that infamous ramp. What could go wrong, right? I always worry when it comes to Doug. He has one of a kind experiences … often! But, he’s also just so dang lucky. I get a call on Saturday afternoon and he tells me how the sailing is going, who he’s run into, who says 'hi,' and all about the weather, the competition and the lake level. No news is good news, right? That would be wrong. Sunday, I was up a ladder most of the day taping and bedding and before I knew it, the day was gone and Doug should have called already to say he’s won the regatta and is on his way home … but he hadn’t called. So, I ring him up and he breaks the news that he didn’t win. He finished 4th. The combined ages of the top 3 sailors were still more than 17 years younger than Doug which he sees as a good sign for the class, as well as for him being able to keep up. He tells me he’s been on the road for a couple of hours and proceeded to talk about all sorts of things for almost 15 minutes and then says something along the lines of, “listen I had a little surprise that I need to tell you about … you know how that ramp is really steep?” My heart sank and I reluctantly asked, “What happened to the trailer?” and he says, “It wasn’t the trailer.” I cringed and continued, “What happened to the car?” He continued to stall “It wasn’t the car.” Phew! “The dolly?” “It wasn’t the dolly?” Oh no! “Your boat?” He says, ”Well, I was really tired and had only made it halfway up the hill and someone came to help and the boat sort of slipped off the dolly, landed on the concrete and started slowly sliding down the ramp.” Holy crap! As I continued to drag information out of him, I learned that this happened on Saturday and bunches of people sprang into action to catch the boat and stopped it from sliding much more than 10 feet and he had already detoured to Austin on his way home to drop off the boat for Fred Schroth to fix. Thankfully, Fred was at the regatta. Doug wouldn’t even look at the bottom until after racing on Sunday and Fred was able to quickly assess the damage and give him a really reasonable quote for the repair. I’ve seen Fred’s work. It’s good. It’s solid and he makes it even better than the original. Everything was going to be okay. Two and a half weeks later, the boat is repaired, back home, and the entire bottom polished out better than new. Thank you Fred! Yep. Doug has unique experiences and he gets lucky. Just don't be standing next to him outside during a lightening storm. He's going to be fine but will definitely have a tale to tell. I told Doug that next time he wants a bottom job on his boat that he could simply ask instead of tossing the boat on the ramp and giving it a good shove. Whoever that fella was that was looking to match the gelcoat on his Aussie Laser, give Fred a call. It was perfect! That was me saying "hi" on Sunday morning during the best oatmeal breakfast I've ever tasted. Doug looked a little tired but understandably so. It blew 20 by the third of five races Saturday gusting into the low 30s according to the PRO. I always like seeing Doug at the races. True sportsman and a damn good sailor. Ah, yes! I remember. Last time I saw you was at the AYC Centerboard Regatta. And why aren't you sailing a Laser these days? I've thought about getting another Laser as my first try was a little premature for my sailing ability. 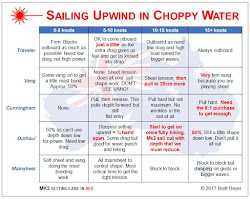 I've got some time in a number of different boats now (RS 600, IC and now a Flying Scot) and think I'm better prepared. I'd like to sail one again in a blow and see. The RS Aero was a cool boat but we corrected over Ash for forth and got beat by Hank in third; in my Flying Scot with sails from 1986 and no spinnaker on Saturday. We had no trouble going to weather with them and when we flew the kite could pull them down wind in a boat with a slower rating. And there were a couple of RS Aeros at the Wurstfest Regatta this year. Have you tried one yet? No, but it's something I look forward to. Hank and Ash are really good sailors and they were telling me what a great boat the RS is. Tough to go upwind because it's so light but a real blast downwind. It sounds like an excellent design. 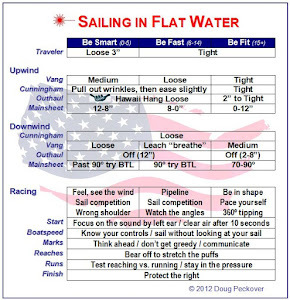 Tough to go upwind? Not sure why they would say that. It's true that it may be easier to put an Aero into irons when tacking in chop upwind than it is for a Laser. But one soon learns to modify tacking technique to avoid that. In almost every other way the Aero is easier to sail upwind in a Laser. The fine bow slices through chop very nicely. You don't get waves breaking over the bow until it's over 20 knots, and even then the cockpit drains so fast that it's no big deal. The shape of the gunwale deflects spray from the sailor much better. 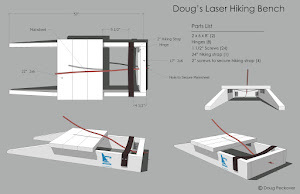 Yes you need to hike, and torquing in waves really works, but this is no tougher than it is in a Laser. You really should try it and form your own opinions. Hank and Ash were talking about how light the RS is and how the only penalty is less momentum going upwind compared to a Laser which makes sense because a Laser hull weighs twice as much. I commented that it sounds like an RS is like sailing a windsurfer and they agreed. Clearly, the RS design is better than a Laser, but then so was the Force 5 that came out at about the same time. The Laser took off because it was simple and had great ads (Bruce Kirby was editor of One Design Yachtsman, now Sailing World), and quickly attracted the top competitors. For now, if you want the best design you'll sail an RS. If you want the best competition you'll sail a Laser. Or sail both boats and get the best of both worlds! That would be fun but Pam and I have a slight problem - we already have two Lasers, two Sunfish, two Butterfly, and one jet ski. My memories of Lake Canyon from 20 years ago - parking gendarmes running around on golf carts barking at you if you even THOUGHT of parking in the wrong spot. They didn't like dollies, interfered with their elaborate plans for rotating cars and trailers through during launch and retrieval. Of course, there is a nice park adjacent to the club that is quite convenient for dolly launching. However it was usually closed for one reason or another, or full of pothead catamaran sailors. The support people know that launching at Lake Canyon can be a problem and it was especially hard this year because the water was high and some of the docks could not be used. There must have been a dozen people helping and they did an amazing job for all of the competitors. I think I would go an d hang out with those pothead catamaran sailors. PS Are all catamaran sailors, potheads? PPS Why did nobody tell me this before? I missed out on this too.